At the end of May 1910, a month after Princess Juliana’s first birthday, she was to be presented to the citizens of Amsterdam. The programme included a festive tour through the capital, whereby the Concertgebouw was to be honoured with a visit by the royal family as well. Willem Mengelberg was the obvious choice to compose a festive cantata for this occasion and perform it in style. However, at the beginning of April it turned out that he would be absent on the planned date, so Diepenbrock was approached. He was requested to write a work with a duration of 20 to 25 minutes within five weeks. This was inconvenient, as he was busy with the preparations for a concert with the Concertgebouw Orchestra on 14 April. Besides the Fourth Symphony by Mahler, he was supposed to conduct four of his own works, including the premieres of Der Abend (The Evening, RC 92) and the Hymne voor viool en orkest (Hymn for Violin and Orchestra, RC 66). Both authors provided a text, but as Diepenbrock considered Van Moerkerken’s contribution dry and literary (BD VI:253), he preferred the libretto by Verhagen, titled Blijde intrede. Ode aan Prinses Juliana bij haar eerste bezoek aan Amsterdam, Mei 1910 (Joyous Entry. Ode to Princess Juliana on Her First Visit to Amsterdam, May 1910). The transmitted manuscripts contain the orchestral introduction (16 measures), the soprano solo (28 measures), a sketch of the extensive tenor solo and the first two measures of the final chorus. 1 This is not the first time this theme appears. It can already be found on the back of a sketch of the Carmen saeculare (RC 52) from 1901, and then again in August 1908 as a possible element for Der Abend (RC 90). In May 1909 he used the same theme for the beginning of the unfinished song Liedren als klinkende luiten (Songs as Sounding Lutes, RC 96*) on a text by Willem Kloos. 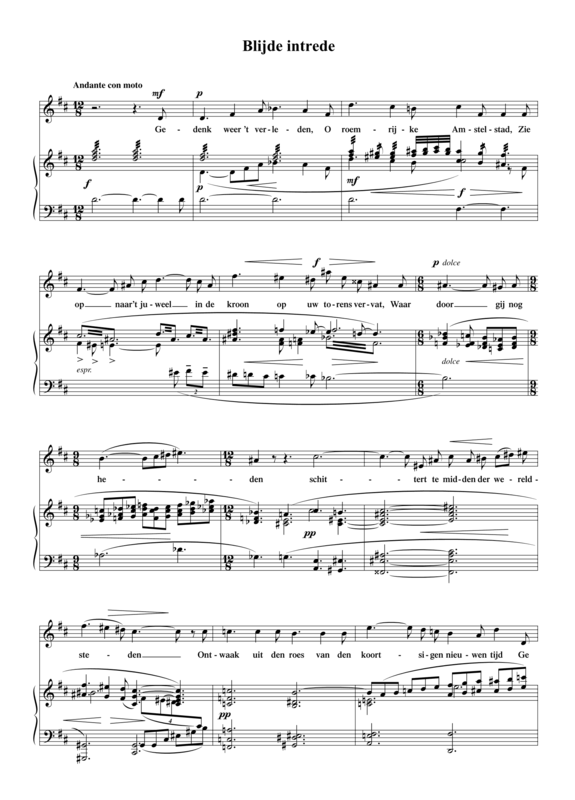 After the cantata for the inauguration of Princess Juliana was cancelled, it was transformed into the opening melody of the Weihnachtslied (Christmas Song, RC 107*) that Diepenbrock composed on 15 June 1910, but also rejected. See BD VI:415-416, note 248-2. Also see E. Reeser, ‘Uit Diepenbrocks schetsboeken’, Mens en melodie 1 (1946), 158-160. 2 From an announcement in the newspaper Utrechtsch Nieuwsblad of 25 April 1910. Schittert te midden der wereldsteden. Komt u de adem der lente doorstroomen! De zonnige Mei spint heur glansen om ’t grijze stadhuis. Het windeke uit zuiden omspeelt het met streelend gesuis. Sluimert een bloesem nauwlijks ontloken.